Two new studies in Nature predict major disruptions to the world’s supplies of fresh water. While some areas will become drier, others will receive much more rainfall, and others will be unable to cope with the run-off from previously ice-bound catchment areas. The first study, from the United States Geological Survey, looks at global shifts in water availability using stream-flow measurement archives from 165 locations around the world and an ensemble of global climate models. While water availability is directly related to climate, there is no simple relationship for all regions between future temperatures and future water resources. Some regions may experience increases in precipitation and run-off while other regions may experience decreases. By the year 2050, the models predict 10 to 40 percent increases in runoff in eastern equatorial Africa, the La Plata basin and high latitude North America and Eurasia. Decreases of 10 to 30 percent in runoff are predicted in southern Africa, southern Europe, the Middle East and mid-latitude western North America. “A warmer atmosphere can carry more water. So, warmer winds can deliver more water to a region, but they can also take more away. This give-and-take plays out differently in different parts of the world, causing decreases in water supply here, and increases there,” explained Christopher Milly, lead author of the study. The study concludes by warning that changes in sustainable water availability could have considerable regional-scale consequences for economies as well as ecosystems. The second study, conducted by researchers from the Scripps Institution of Oceanography at the University of California, San Diego, examined the impact that shrinking glaciers and disappearing snow areas will have on fresh water supplies, concluding that the ensuing water shortages will impact millions of people around the world. The study says that the forces driving these changes – described as “greenhouse physics” – show that in a warming climate more water will fall in the form of rain rather than snow, filling reservoirs to capacity earlier than normal. Additionally, a warming climate will result in snow melting earlier in the year, disrupting the traditional timetable of run-off streams. These changes mean less snow accumulation in the winter and earlier snow-derived water run-off in the spring, challenging the capacities of existing water reservoirs. Water shortages will occur in areas where reservoir capacity cannot hold the increased run-off. For Canada, the study suggests that earlier spring water runoff will threaten agricultural production in the Canadian Prairies. In Europe, climate warming in the Rhine River Basin may reduce peak-demand water availability for industrial applications, agriculture and household uses. Ship transportation, flood protection, hydropower generation and revenue from skiing all could be threatened as a result. 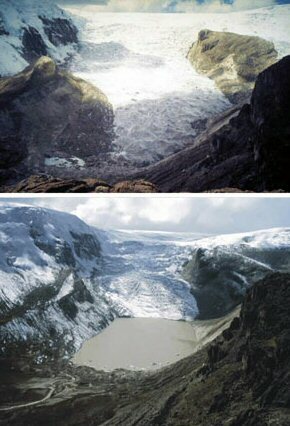 It seems that Asia might be at most risk from retreating glaciers. Barnett believes China, India and other parts of Asia will be particularly impacted due to their high populations and the fact that the ice mass in the mountainous area of this region is the third largest on Earth.